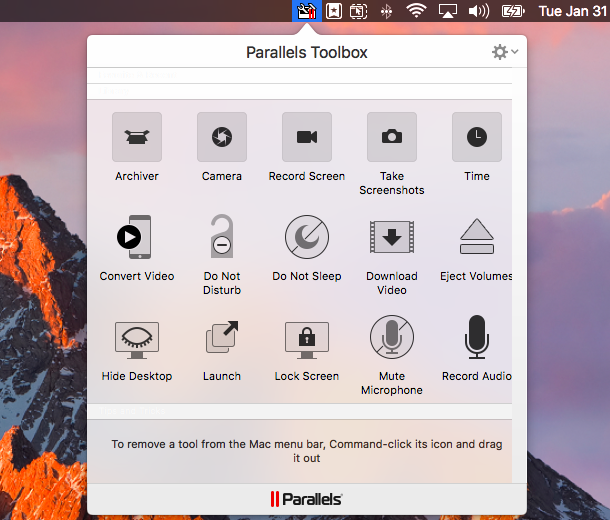 Parallels Toolbox is a macOS app for power users that provides easy access to dozens of utilities -- like camera controls, screenshot options, archiving and more -- from the menu bar. Now, there is a new version available and it comes with three changes designed to improve the user experience. Toolbox 1.5 adds the option to drag and drop tools, capture audio from the Mac, and change the sources for the camera and microphone. Let's take a closer look at the latest changes. More specifically, the addition of drag and drop for tools means that you can now place utilities in the Dock, desktop, menu bar or the Favorite & Recent area, that is part of the Toolbox menu. Those are only shortcuts, so if you want to get rid of a utility you placed on the Dock you can simply remove it and it will still be available in Toolbox afterwards. The option to capture audio from the Mac is an addition to the existing functionality under Record Screen. I mentioned above that you can change the source, and you can do that by right clicking on the utility you want to use, selecting "Preferences..." and then opting for the source you prefer. Toolbox 1.5 is available to download from Parallels' website. The app costs $9.99, and there is a free trial available as well.